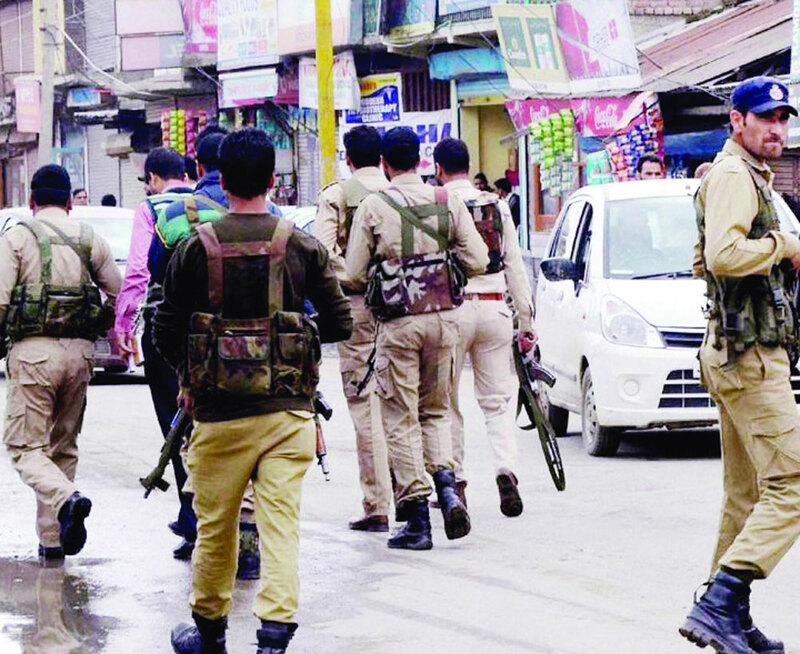 Recent incidents in Jammu & Kashmir viz the killing of four policemen in Shopian district and the abduction of 11 family members of six policemen from some villages and towns of four districts of south Kashmir by terrorists have shocked the nation. Such instances of targeted attacks on policemen’s kin were rare before. Incidents like these are considered to be a ploy of terrorists to demoralise our security forces and prevent local residents from supporting the counter-terrorism campaign of the Army as well as the Jammu & Kashmir Police. Killings of police officers and their informers have taken place earlier too but present incidents are considered a tactic used by terrorists to put pressure on the authorities after our security forces conducted multiple raids and arrested many relatives of some terrorists in the area a few days earlier. Incidents like these were also witnessed in 2016, when a local militant, Burhan Wani, was killed.In an incident reported on August 29, militants fired indiscriminately upon a police party at Shopian’s Arhama. In the latest incident of August 30, terrorists barged into the homes of police personnel in Pulwama, Anantnag and Kulgam districts in south Kashmir and kidnapped their family members. Those kidnapped included brothers of a policeman posted in Srinagar and the son of another policeman who worked as a cook at the police training centre. In her appeal to the terrorists, the mother requested to show mercy to her son. A video uploaded on social media showing the family and relatives pleading for the child’s release went viral. All of those who were kidnapped were freed later with a message from Hizbul Mujahideen leader Riyaz Naikoo that they resorted to the act in retaliation to the actions of the Army, Special Operations Group, and Jammu & Kashmir Police targeting homes of their members. Apparently, Naikoo’s father had been picked up by police after the killing of four local policemen in an ambush near Shopian as he was suspected of having provided shelter to the killers. The kidnapping incidents underline several hard realities the Kashmir Valley has been facing since its accession to India 70 years ago on October 26, 1947. The question now is: Why are innocent people being targeted? They are local inhabitants and a part of the local cultural milieu. But in the eyes of the terrorists, they are probably guilty of blasphemy because they are working under a system controlled and run by the ‘kaffirs’. The new Governor of Jammu & Kashmir, Satya Pal Malik, the first politician appointed to the gubernatorial post in five decades, expressed his willingness to reach out to the people to strike a better relationship and win people’s confidence. Discussions on development and grievances of the people with their representatives are his priorities. Immediately after taking over, as a first step, he cleared one of the crucial complaints of the MLAs by ordering disbursements from their Local Area Development scheme that remained suspended for long. Malik said, “People of Kashmir have to feel they are not inferior in any manner. And while doing this, I want to bring in a system where there is no casteism, no favours and no sifarish (recommendation). I want to totally do away with sifarish. What I want to do is create a corridor of faith.” He also decided to increase the number of safe residences for policemen and ordered that compensation for families of policemen killed in action to be at par with CRPF and the Army. This is not for the first time that somebody in authority has given such assurances or made such friendly gestures. Such assurances were given earlier too and action had been taken to the extent possible but it yielded no results. This change in the Valley has not come overnight. The process of radicalisation started in 1931 after a young Sheikh Abdullah came out of the Aligarh Muslim University. He came to the Valley and started his tirade against ruler Maharaja Hari Singh from a mosque. Secularists like Jawaharlal Nehru saw Sheikh Abdullah’s revolt against the Maharaja as a war against feudalism. In fact, for Sheikh Abdullah and his followers, it was a fight by good Muslims against kaffirs. Today, there is no Maharaja and the State is ruled under a democratic system. But Islamic fundamentalism continues. The latest victims of so-called jihad are poor Muslims who have chosen to work for the Indian nation but are dubbed as agents of the kaffir. The immediate fallout of the accession of Jammu & Kashmir to India was the transfer of political power from Jammu to Kashmir. Since then, top ministerial posts, such as the Chief Minister, Home Minister, Finance Minister et al have been the privilege of Kashmiri Muslims. They are also major beneficiaries of jobs in Government and semi-Government offices. Delhi not only facilitated this transfer to appease the Muslim community but also granted the State a special status through Articles 370 and 35A. Article 370 drove the State away from the political and Constitutional organisation of India and empowered it to have a separate Constitution and a separate flag. It also empowered the State to exercise all powers, including the power of taxation. Article 35A barred all the non-permanent residents from exercising any citizenship right in the State and deprived the daughters of the State of their natural right to marry persons of their choice from other parts of the country. Jammu & Kashmir is also the most privileged State in the country in terms of financial benefits it gets from the Centre. It may be noted here that only one per cent of the country’s people live in the State but it got 10 per cent of all Central grants between 2001-2016. On the other hand, Uttar Pradesh, which has 13 per cent of the country’s population, received only 8.2 per cent of Central grant during the same period. While the per capita Central assistance to the border State during this period was as high as Rs 91,300 per person, in Uttar Pradesh, it was a paltry Rs 4,300 per person. Also, during the same period, Jammu & Kashmir got Rs 1.14 lakh crore in grants, which is more than 25 per cent of the Central funds granted to 11 special category States. Unrest in the Valley has nothing to do with unemployment, development or regional aspirations. Many residents in the State occasionally raise Islamic State flags, shout slogans in favour of Pakistan or pelt stones at the Army personnel when they are busy chasing or eliminating the terrorists. Obviously, they are not seeking jobs and development — their motivation is something else. They are fired by an Islamic zeal or Islamic theology which divides the world into believers and non-believers. And in their understanding of Islam, non-believers have no right to exist and believers have a divine duty either to turn kaffirs into believers or eliminate them. That is the reality of Kashmir.